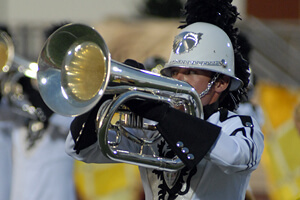 It's been 309 days in the making, but the 2011 Drum Corps International is underway! For the first time in Drum Corps International's 39-year history, the eight top placing corps from last year's DCI World Championship kicked off a new season together in one venue. 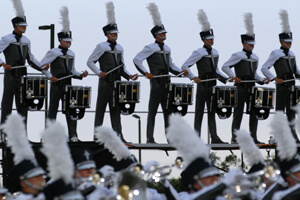 Blue Stars, Santa Clara Vanguard, Phantom Regiment, The Cadets, Carolina Crown, Bluecoats, The Cavaliers and Blue Devils all took the field on Saturday, June 18 in Saginaw, Texas, marking their first competitive performances of the season. With several productive but tiring weeks of pre-season rehearsals under their belts, it was a relief for many of tonight's performing corps to be able to showcase their talents to a packed stadium. But doing so amongst their most competitive foes from last season, came with added anxiety. "You can't deny the pressure you're under to be up against the other top eight corps right out of the gate," said Cadets Drum Major Ben Pouncey. "The corps was extremely prepared tonight, and I think that is attributed directly to their work ethic and preparation during the long spring training process." "To be honest it is a little crazy. This will be my eighth year of drum corps and the first year that [all of the top corps] are here together right off the bat," said Santa Clara Vanguard Drum Major Brandn Lindsey. "It's taken a lot of preparation, but it kind of boosted our momentum as we were trying to make our show that much better." Lindsey says that the corps' design team has been focused on making sure the corps had a finished production on the field in time for the first event. By the look of all of the groups in Saginaw, the number of corps with completed guard costumes, flag silks, music and drill formations, is at an all-time high for this early in the season. 6th: Bluecoats 5th: Blue Devils 4th: Carolina Crown 3rd: Phantom Regiment 2nd: The Cadets 1st: The Cavaliers As corps take their first marching steps in a journey that will cover some 10,000 miles across the United States this summer, Vanguard's Lindsey shared a sentiment that will no doubt resonate with all of the groups participating in the 2011 Drum Corps International Tour: "We're really looking forward to just bringing back the [corps] to where we should be, and really letting the audiences know that this is us; we're back.